If you've been injured in a car accident or suffered an injury that wasn't your fault, you will need help sorting out multiple legal issues. Most Kansas personal injury cases stem from car accidents. It takes one driver too concerned with a text or making the wrong decision to impact your life in the wrong way. Did the offending party act reasonably under the circumstances? Were their actions contradictory to responsible behavior? Were your injuries a direct result of their actions? Did you suffer monetary damages because of their actions? If you answered "yes" to these, you may have a personal injury case. Your next move is with an attorney who can provide you with feasible options related to your circumstances. Slape & Howard eagerly awaits the opportunity to help you put your life back on track. Meet with us and learn your path toward recovery. Would you try to land a plane without training? Then don't try to navigate a personal injury or motor vehicle claim without a law background. Our education and experience have provided us with the ability to maneuver through complex laws that often cross over into other areas such as workers' compensation, social security, and probate law. If you have been injured as the result of someone's negligence, have expenses of $2,000 or more, or have sustained a permanent injury, you may be eligible to make a legal claim. One of our attorneys can provide a free initial consultation, and your fee for any services will be a percentage of any money recovered on your behalf. Seek the counsel of experienced legal representatives to ensure you know all your options. The attorneys at Slape & Howard are ready to listen. Contact us today. It wasn't your fault and shouldn't be your burden if you've been injured in an accident caused by someone else's negligence or wrongdoing. 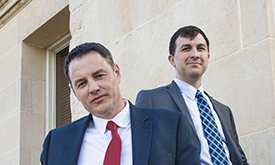 Begin your recovery today by setting up a free consultation with an experience personal injury attorney at Slape & Howard in Wichita, KS. We're ready to hear your story.